The summer holiday is soon here, and for some, nothing means summer more than a backyard barbecue. While many enjoy getting together in the great outdoors for a family barbecue, some may not consider the safety risks involved with grilling. When planning your next summer party, keep these tips in mind for fire pit and barbecue safety. Before you fire up the grill, be sure that you are taking the proper precautions to keep you and your family safe. It’s best to keep your grill surface clean, as grease can cause flames to become unmanageable. Never use a grill inside. While small table-top grills are increasing in popularity, even these shouldn’t be used indoors. Besides the risk of fire, the smoke from the grill can be toxic, and it is best to grill in a well-ventilated area. Place your grill outside of foot traffic and at least 10 feet away from your home. Be sure that it is on a level surface, and if your grill has wheels, be sure that they are locked into place. The area should also be clear of overhanging branches. While your idea of the perfect steak may be medium rare, serving undercooked meat is a sure-fire way to dampen any backyard barbecue. Be sure you are serving safe by using a meat thermometer. Be sure to also follow other food safety measures, like washing your hands and keeping hot food hot and cold food cold. We’re not here to argue which offers the better flavor, gas or charcoal. As far as barbecue safety is concerned, both have their advantages and disadvantages. 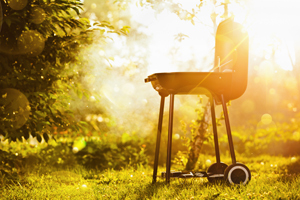 If your grill uses propane or gas, before turning it on, check for leaks or blockages. You can test for leaks by covering hoses with soapy water and releasing some gas into the grill. Never turn a gas grill on while the lid is closed. If you’re a charcoal fan, never use any lighter fluid unless it is specifically designed for charcoal grills. Once you have your coals lit, do not add more lighter fluid. Whether you use charcoal or propane, always be sure to read the user’s manual before using your grill. Backyard fire pits have grown in popularity in the past few years. While they are nice way to warm up an outdoor gathering, there are some considerations you need to take before toasting those marshmallows. Different neighborhoods, boroughs and townships have varying laws and regulations about tending an open flame on your property. Before you even purchase or install a fire pit, be sure that is within the limits of the law. Wind speed and direction can affect how easy it is to contain the flame within your fire pit. Also, if there is the threat of a drought, it is not advised to have an open flame on your property. Your neighborhood may have additional regulations during droughts. Like a grill, a fire pit should be placed a safe distance away from your home, at least 10 to 15 feet away. Unlike a grill, the open flame of a fire pit and its close proximity to the ground means that it should only be placed on fire-proof surfaces, such as slate or stone. In case your fire spreads, keep a shovel, bucket of sand or baking soda nearby. These can help douse the fire if you do not have a portable fire extinguisher available. Part of the appeal of fire pits is that fuel, depending on your area, can be cheap and readily available. However, the trees in your backyard may not be suitable for burning. Soft woods, like pine or cedar, can cause the fire to spit sparks. For this reason, hard woods, like fruit trees, mesquite, hickory or oak are recommended. In addition, old furniture or other types of pressure-treated wood are not ideal for fire pits, as they contain harmful chemicals that are released when ignited.